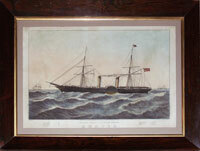 A magnificent lithographic print on wove paper with original hand colour. Lithographed by Thomas Dutton after the painting of Oswald Brierly and published by Rudolph Ackermann in the Strand, London in 1854. Copper plate engraving with original hand colour published by Mondhare in Paris circa 1750. A pair of copper plate engravings with extraordinary watercolour and gouache colouring; published in London by Carington Bowles circa 1790. A large scale lithograph, drawn and lithographed by Thomas Goldsworth Dutton; published in London in 1867. 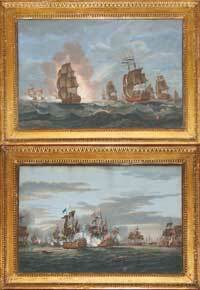 TO ADMIRAL SIR HYDE PARKER, Kt. COMMANDER IN CHIEF, Vice Admiral Lord Nelson and Rear Admiral Thomas Greaves, THE Captains, Officers, Seamen, Marines and Soldiers of the BRITISH FLEET, THIS PLATE representing THE ATTACK of the DANISH FLEET and BATTERIES off COPENHAGEN, the SECOND OF APRIL, 1801, Is dedicated with the greatest respect by their most Obedt. Hble. Servt. P. W. TOMKINS. An aquatint and line engraving by Tomkins after the painting by Serres, commemorating the Battle of Copenhagen; published in London, three months after the battle, in July 1801. A large scale mezzotint engraving by James Ward after the painting by John Singleton Copley; published in London, August 1800. The Battle off CAMPERDOWN fought on the 11th October 1797. This plate is respectfully dedicated to LORD VISCOUNT DUNCAN, the OFFICERS and SEAMEN who so gloriously fought under the command of JOHN BRYDON. 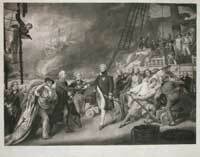 A large aquatint engraving by Thomas Hellyer after the painting by Thomas Whitcombe; published in London in 1799. A magnificent lithograph with original hand colouring; executed by C. Parsons after the painting by Samuel Walters and published in New York in 1850. A large hand coloured lithograph by Charles Parsons after Samuel Walters; published in New York by Currier and Ives in 1867. The Scotia was the finest and the last paddle steamer to be built for trans-Atlantic service. It was built in the shipyards of Glasgow and painted when it was in dock at Liverpool. It made regular journeys across the Atlantic between Liverpool and New York. In this image the ship is pictured off the coast of Newfoundland at Cape Race. J.W. EDY after Robert Cleveley. Aquatint printed in colours and hand finished, engraved by J.W. Edy after Robert Clevelely, published by John Harris in London, 1797. The Magnificent Stemship "New York" of the American Line. Coloured lithograph published in New York by Currier & Ives circa 1893. 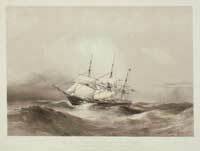 In a gale on the 22nd April 1858, in the Gulf of Pechili, China. Lithograph with gentle tinting; lithographed by Thomas Goldsworth Dutton after the drawing of Captain Bedwell and published by Day and Son in London circa 1860. The Model Yacht "Truant" 3½ tons. The property of R. M. Grinnell Esq. Built by Mr. R. Fish of New York 1852. The winner of three races in Liverpool and two in Ireland. A lithograph in original hand colour by Thomas Dutton after the drawing by Samuel Walters, published in Liverpool in 1853. A tinted lithographed on wove paper, published by John Raphael Isaac in London circa 1856. 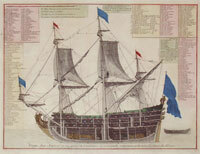 Copper engraving with original hand colour, published by Mortier in Amsterdam c.1700. A hand coloured lithograph by N. Currier after the painting by F. Palmer, published in New York in 1853. A hand coloured lithograph by Dutton after the painting by Condy and published by Day and Haghe circa 1850. T. DUTTON after N. Condy. Charles ROSENBERG after William HUGGINS. 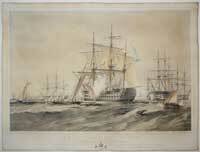 The Right Honourable Lord Yarborough's Yacht, the Falcon or 351 Tons. 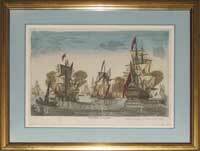 Aquatint printed in colours, engraved by Rosenberg after Huggins, published London 1835. By Thomas Goldsworth Dutton after his own drawings, produced by Day and Haghe and printed by William Foster in London circa 1850.